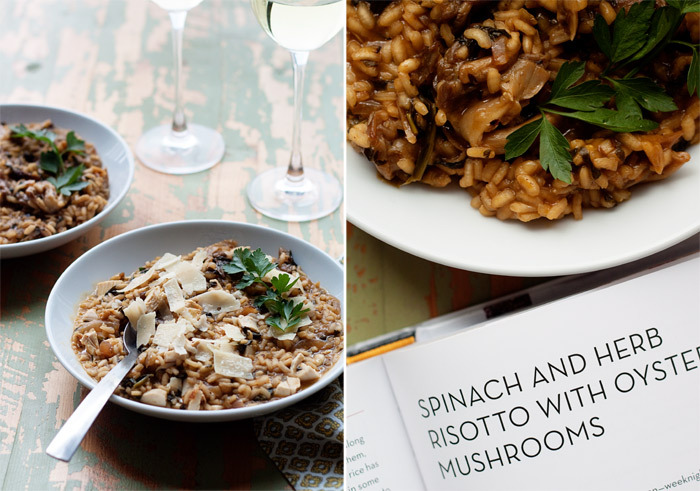 Special-occasion-worthy risotto, three different ways. 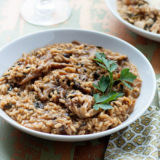 Vegan, vegetarian, or meaty – no matter which way you choose, this risotto is packed with flavor. “That’s the cookbook I wanted to write someday!” I thought. But instead, an accomplished, James Beard award-winning cookbook author had written it – someone who has written cookbooks that I really like, to boot. Grr! Think The Vegetarian Epicure and Love Soup. Thankfully, my jealousy turned to excitement pretty quickly, because the truth was, I was pretty excited to crack open Anna Thomas’ latest. As it turns out, Vegan Vegetarian Omnivore – with loads of vegan base recipes and options for taking them in both vegetarian and meaty directions – is indeed perfect for Kitchen Treaty readers. But I find it to be more of a special occasion cookbook – a bit different than my more everyday point of view. And I love that, because even if you don’t live in a mixed-diet family, almost everyone encounters dietary differences when it comes to holidays and parties. 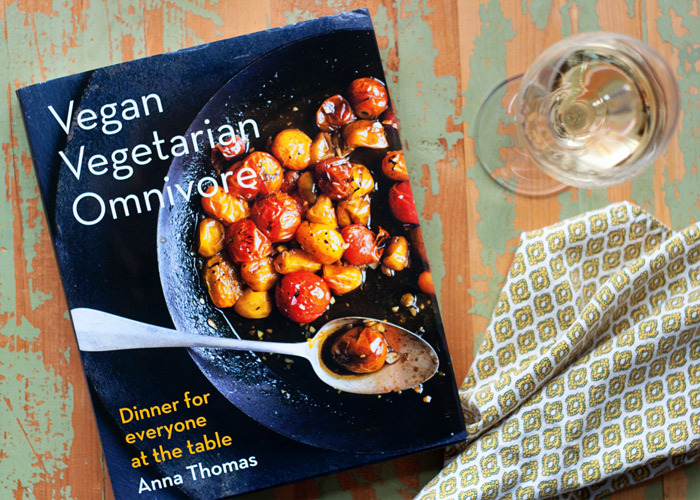 Vegan Vegetarian Omnivore is the kind of cookbook you’ll enjoy reading cover to cover, then whipping out whenever you want to seriously impress guests – even better when a plethora of dietary preferences and requirements are presenting themselves at the table. Each dish is both familiar and different, often with one or two special ingredients you might not use in everyday cooking. For me, I like how it bumps me a bit out of my comfort zone and challenges me to try new things. I need that now and then! 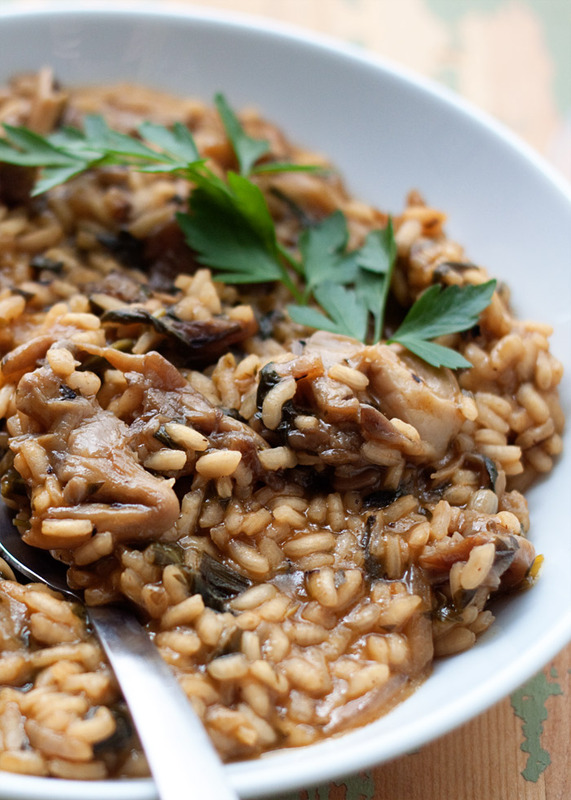 This Spinach & Herb Risotto with Oyster Mushrooms has two ingredients I’d never tried – and I’m now in love with both. Oyster mushrooms – so (for lack of a better word) meaty! And mirin – Japanese sweet rice wine. Holy moly. Glazed oyster mushrooms, cooked with a splash of mirin until golden. Such flavor. This risotto recipe made me believe that a vegan risotto can be just as good as risotto served up with tons of Parmesan. The parm is truly not necessary, as it turns out, although in the spirit of the cookbook (and Kitchen Treaty too!) it is an option. So is chicken. My guy enjoyed his with warmed cooked chicken and a sprinkle of shaved cheese. And I rewarded myself by sneaking a few extra glorious mushrooms into my own serving. If you’re looking for more flexibility and interesting choices for serving yourself, your family, and your guests – particularly on special occasions – consider adding both this recipe and the book to your arsenal. One gripe I do have about the cookbook is the lack of prep and cook times. I need that! But if you read through the recipe thoroughly before starting, you should get a good feel for about how long it should take. (And I did add my own prep/cook times to the recipe I’m sharing below). Vegan Vegetarian Omnivore: Dinner for Everyone at the Table is available now on Amazon. To make this as a chicken dish, dice some poached or roasted chicken – leftovers are welcome – and warm it gently in a bit of chicken broth, then stir it into individual portions before topping with the oyster mushrooms. Clean the mushrooms and slice them lengthwise if large, or simply pull apart the clumps if small. Heat 2 tablespoons olive oil in a medium skillet and sizzle half the chopped garlic in it for about 15 seconds. Add the mushrooms and a big pinch of salt and toss the mushrooms over high heat for 4 to 5 minutes. Add the mirin and continue to stir and toss the mushrooms as the liquid cooks away and the mushrooms develop golden edges, 4 to 5 more minutes. Turn off the heat and leave the mushrooms in the warm pan until needed. Bring the vegetable broth to a simmer and keep it hot in a covered saucepan. Heat the remaining 2 tablespoons olive oil in a large nonstick saute pan and saute the red onion, remaining garlic, and green onions over high heat, stirring, until the onions begin to color, about 6 minutes. Add the rice to the onion mixture and stir it over medium heat for 2 to 3 minutes. Add the wine and keep stirring as it cooks away. Add the spinach, parsley, and oregano and gently lift and turn the rice and spinach together for 2-3 minutes, until the spinach wilts. Add a soup ladle of the hot broth to the rice and stir it in, keeping it just at a simmer. When the liquid is nearly absorbed, add another ladleful. Continue this way, adding broth a bit at a time and stirring constantly with a wooden spoon, until most of the broth is used and the rice is al dente, 20 to 25 minutes. A slightly creamy sauce will form around the rice kernels, which are no longer crunchy but still firm. 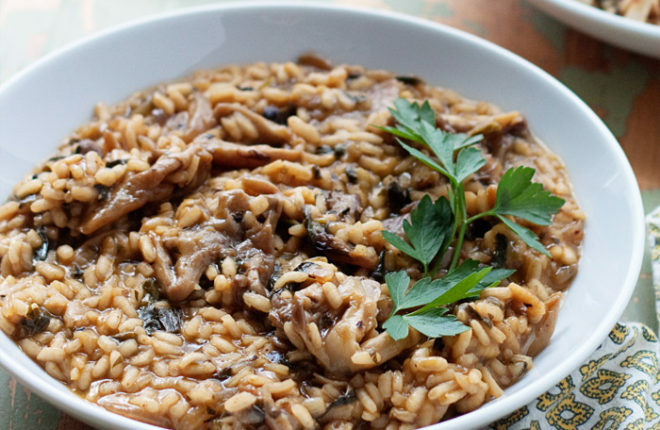 Shortly before the risotto is ready, give the mushrooms another stir over medium heat – just a minute or so. When the rice has achieved the perfect tender-firm texture, squeeze in a few drops of lemon juice, stir in a last ladle of broth and the gated Parmesan cheese (if using), and taste. Correct the seasoning with another drop of lemon or a bit of pepper if needed. 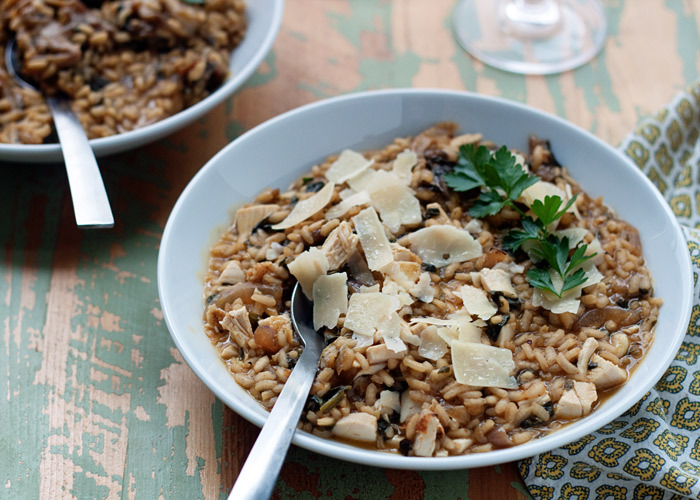 Spoon the risotto into shallow bowls. Drizzle a little olive oil on top of each serving and top with a spoonful of the sauteed mushrooms. Pass additional Parmesan cheese. 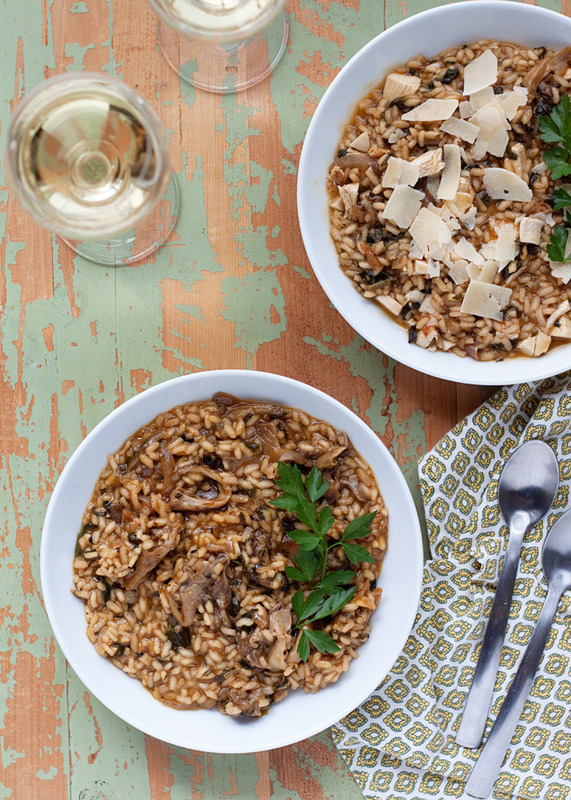 The Parmesan cheese can be left out of this risotto – it will sill have plenty of flavor. However, if you want some of that creamy richness, you can stir in a small amount of a vegan cream cheese, such as Tofutti, or add 1/2 cup chopped toasted pine nuts. Recipe from Vegan Vegetarian Omnivore by Anna Thomas. Copyright © 2016 by Independent Productions, Inc. With permission of the publisher, W. W. Norton & Company, Inc. All rights reserved.